Figure 2.18 from Goldau’s thesis: Overview of techniques for visualizing probabilistic diffusion tractography. Paragraph 2 of the abstract: This thesis is dedicated to enrich tractography visualization techniques by combining different types of data and modalities. Therefore, in Chapter 3, I propose a new visualization technique to map important parameters on fiber bundles segmented from line-based tractography. In Chapter 4, I introduce Fiber-Stippling, which is a new interactive, illustrative, and slice-based rendering technique for volumetric tractography data. Fiber-Stippling is designed to save space for anatomical context while still being able to effectively communicate tractography data. Moreover, in Chapter 5, I systematically analyze visualization techniques for probabilistic tractography data and discuss how to integrate other image modalities. Read the full text at ResearchGate. Google Scholar listing with bibliographic details. Abstract: The concept of curvature and shape-based rendering is beneficial for medical visualization of CT and MRI image volumes. Color-coding of local shape properties derived from the analysis of the local Hessian can implicitly highlight tubular structures such as vessels and airways, and guide the attention to potentially malignant nodular structures such as tumors, enlarged lymph nodes, or aneurysms. For some clinical applications, however, the evaluation of the Hessian matrix does not yield satisfactory renderings, in particular for hollow structures such as airways, and densely embedded low contrast structures such as lymph nodes. Therefore, as a complement to Hessian-based shape-encoding rendering, this paper introduces a combination of an efficient sparse radial gradient sampling scheme in conjunction with a novel representation, the radial structure tensor (RST). As an extension of the well-known general structure tensor, which has only positive definite eigenvalues, the radial structure tensor correlates position and direction of the gradient vectors in a local neighborhood, and thus yields positive and negative eigenvalues which can be used to discriminate between different shapes. As Hessian-based rendering, also RST-based rendering is ideally suited for GPU implementation. Feedback from clinicians indicates that shape-encoding rendering can be an effective image navigation tool to aid diagnostic workflow and quality assurance. 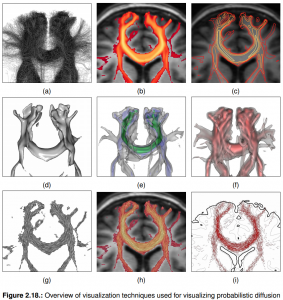 Abstract: Rendering large numbers of dense line bundles in three dimensions is a common need for many visualization techniques, including streamlines and fiber tractography. Unfortunately, depiction of spatial relations inside these line bundles is often difficult but critical for understanding the represented structures. Many approaches evolved for solving this problem by providing special illumination models or tube-like renderings. Although these methods improve spatial perception of individual lines or related sets of lines, they do not solve the problem for complex spatial relations between dense bundles of lines. In this paper, we present a novel approach that improves spatial and structural perception of line renderings by providing a novel ambient occlusion approach suited for line rendering in real time.